On the eve of the first running event I have ever organized, I am doing a lot of thinking, contemplating just how I got here. Many years and experiences and most importantly, people – have led me to this point. I am Race Director of TOM. 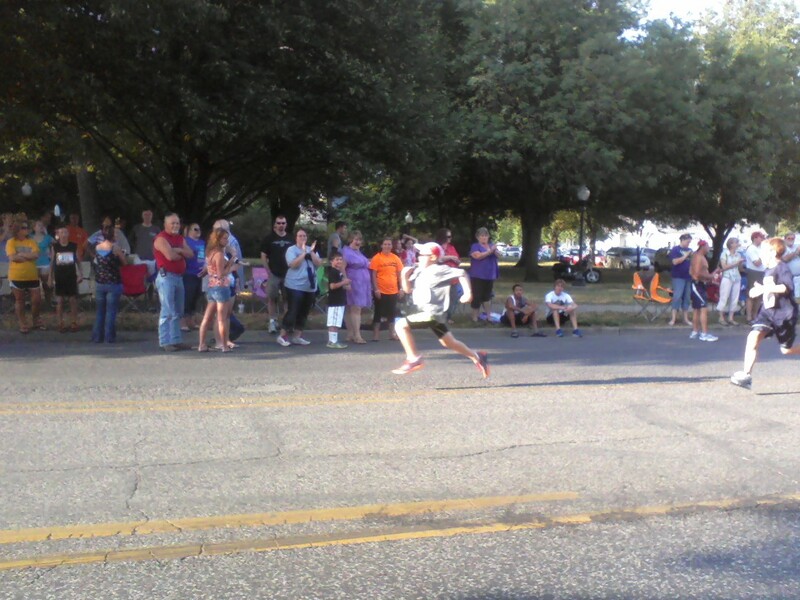 TOM is The Oberlin Mile, to be run and make history in a small, rural northwestern Kansas town. For many people I have talked with about TOM, “Why?” has been a steady and pretty reasonable question. The short of it is, because I was led to it. There are two distinct, concentric circles in this miler’s story, one in Kansas, and one in Indiana, and they are also overlapping and intertwined, and one leads on to the other. My story has come and gone full-circle from Indiana to Kansas and back again. And it is the people in my life who have made it so. Summer of 1976, I was becoming a freshman in high school. I had been running formally since junior high, but informally since I began getting tired of walking the same path day after day from school to my father’s office downtown, especially with the large, awkward shape and to a lesser extent- weight, of my cello, which I carried to and from school most every day. In a word – boredom. In another word – tedium. So, I start running it. It was only, in actuality, 4 blocks if you just count crossing side street intersections; but more like seven blocks if you figure the actual length of the blocks. Still, in my mind it seems a long walk; a long way downtown to Merchants National Bank Building, where my father and grandfather shared their optometry offices. I think if I said to my brother, Ty, “You know, it’s only four blocks from State High to Merchants…” he’d say, “No way!” I guess I need to ask somebody at home to go down and verify it for us. The memory and scale in a kid’s mind sticks, somehow. So for me, it’s still a long boring, tedious walk. So that’s why I started running it. To get it over with. Maybe not with my cello, but on the non-cello days. That was it. Same old street, same old route got to me. Running it took care of the whole problem. And one of the ancillary benefits of running was that I had more time to sit in my father’s waiting room to read Sports Illustrated and Highlights, and if I had lots of time, maybe explore the building top to bottom; riding the elevator to the eighth floor and walking the stairs all the way down. If I was really daring, I might stop on the floor that was home to the mysterious and forbidden Aero Club, with its opaque glass section door stenciled with simple yet foreboding black, block letters that understated its secret purpose and barred access to unfit and fearful little kids like me, for example. THE AERO CLUB. Members Only. The Aero Club. It was easy to just take a look at that door from the stairwell and no closer, and feel a sense that an old scary guy in a black coat and a meat cleaver would come walking around the corner and say in Boris Karloff’s voice, “You shouldn’t be here, kid” and my heart would explode instantly and I’d die right there, on the spot. And that guy would not know anything when the police came asking around and my dad, with tears streaming down his face would’ve said, “I thought he was in the waiting room reading Sports Illustrated and Highlights.” And they’d never find my little pieced-up body. Ever. So, as you can see, it was worth the run – to get down there as quickly as possible, the adventure, and all. So that’s why I started running. As I said before, it began formally for me in junior high, upon joining the cross country team. The State High Young Sycamores. Except the High School kids were really the Young Sycamores, and that was because the College kids down the street, at Indiana State, were the Sycamores. So that made us – the junior high kids – the Little Young Sycamores, I guess. Anyway, we felt pretty big, because we had the same name as the college kids – The Sycamores. We were a proud little cross country team. And most of us – including Mark, Wendell, Matt, David, Todd R., Frank, Rex, some other guys I can’t remember well enough anymore, and I – we ran together all the way to our freshman year, and some on as sophomores, when, at the end of that year, State closed its doors forever. Those of us who were left were all farmed out to the far three corners of the county, spread by the winds of new loyalties and mortal competitive divisions that defined and separated us for the next few years, partly against our wills – to Terre Haute North, Terre Haute South and West Vigo high schools. But we learned to live with it and eventually to love our new schools. And what was more, we all remained good friends. At my new high school, it was my brother, Ty and my neighbor and teammate, Bill who were my running partners and best friends. And another Todd, who was a golfer in high school, and in recent years has become the runner I still dream of being. Forty years later and I still run with Mark when I visit home. I travel eastern Colorado and the length of Kansas to hunt with Matt on his small farm, and Mark comes west as I drive east, and we all hunt pheasant together. I have visited with Todd R. in recent years in Washington D.C., where he has lived the past 30 years working for the FBI and the TSA – and has raised a son who is a runner. 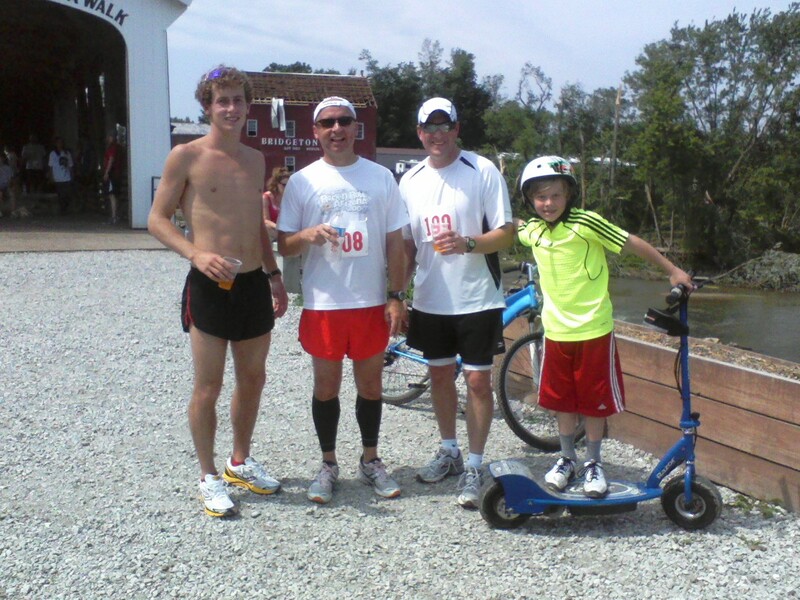 Mark has three daughters who are runners; two even run on the collegiate level. It was Todd the golfer who invited me to run a half marathon just three years ago (he has run many in recent years), and through that spring-long training process in 2011 we rekindled and revitalized a long and deep friendship. Bill has been in the San Francisco area for many years now, and bikes, works out, and must run like a near-professional. Now he, like the rest of us, is north of 50, and he’s in the best shape of his life, better shape than all the rest of us put together. So my running has been with me now for a long time. But it started with some humble beginnings. Down Seventh Street in Terre Haute, from Cherry to Wabash. My first mile race was yet another . . . well, milestone in my life. It was the beginning of a sort of love affair with The Mile. And its beginnings were humble, too. It was at Boy Scout Camp, on a gravel road loop surrounding the camp property. I was in my Scout uniform – everybody was: the shorts, the shirt; both green. And most memorable – the socks. They were the knee-high green official Boy Scout socks held up by the elastic garter with a dark green tassel attached; real throwback to the way-back days of Lord Baden Powell’s British Empire days of Scouting. I don’t remember, but I wouldn’t be surprised if I was wearing my neckerchief, too. At the sound of “Go!” I took off. 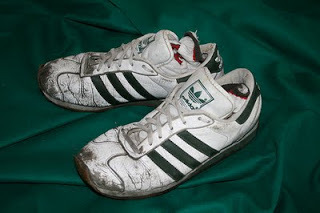 I’m pretty sure those tall socks and garters all fell down in a wad at my ankles almost immediately; I remember what it felt like – sliding down in a heap, feeling loose and messy sitting on top my Adidas Country’s. And of course, those socks. I distinctly remember how weird – and uncomfortable – it felt, my socks down there, all screwed up. But I didn’t slow or get distracted. Dressed totally wrong, not ready for competition – except in my attitude. We raced up the long, gradual sloping road, with crazy, chaotic flashes of sunlight and shadow on the gravel surface, driven by a steady breeze, beneath the massive oaks and maples in full leaf. I kept going, and don’t remember much of anything about passing anybody else – I remember running pretty much alone. Well, it wasn’t running camp, I know; it was Boy Scout Camp, but it was my opportunity – and I took it. With about 600 yards to go, I made the sharp up-sloping right turn into the camp property and under the looming gateway with “Camp Krietenstein” carved and painted in bright yellow on the high overhead beam, and found my second wind and a rush of speed as the course flattened out and the gravel got smaller, easier to navigate. I was pounding and driving now; mechanical and methodical – well-oiled with my head up and steady, fists loose, focusing more now on steady, deep but intensely labored breathing, blowing hard through pursed lips, eyes locked on the farthest visible point of the course, finding a new and well-orchestrated rhythm between my elbows coming up and my chest rising and falling; knees rising and feet reaching, trying to go on the balls of my feet now, pushing off and pushing back; not even trying to listen for foot falls behind me; only concentrating on my pace and rhythm, trying to pick up even more speed. I knew I had it if I would keep this up. I shot out from the narrow tree-lined section of the road into the openness at the parade ground and crossed the finish line. I won – and my younger brother, Ty came in pretty soon after. Most significantly for me – I still remember my time: 6:25. My first mile. Maybe not Meb or Jim, or Seb or Wes, but that’s ok. It’s mine. I didn’t even get a prize. I didn’t care. I got the win, and I got that time, 6:25 – my first mile. I treasure that memory more than virtually any possession I have ever had. And I have loved the mile ever since. I think I owe thanks to a number of guys in my running life. I have recently called several of them and thanked them – for their inspiration, the shared experiences, and in some cases, most of all – their friendship. Running together, especially over decades, does and maintains something special between us. This story is dedicated to a few guys I think of when I think of my life of running. To Mark, for being my pick-up running and Fast Track Mile racing partner (and this is the bare minimum of what he truly is to me as a friend and brother). To Ty, my blood brother and dangerous, adventurous winter running partner. I miss running and spending time with you. To Matt, who was built like Jim Ryun and ran like him, too. I am grateful we, along with Jim Ryun, share Kansas between us now. I am anxious to see you again when Pheasant season arrives. To another John – John Roscoe – though we have never met, I watched you from afar as a little kid learning to run in Terre Haute, hoping to steal a glimpse of the legendary Great Roscoe running through town, home on a visit from KUs’ cross Country team, or training for the World Cross Country championships or the Olympic trials or home training for Boston. Thank you for starting The Mayor’s Cup Mile, which in turn inspired me to found The Oberlin Mile. Perhaps you have no idea how far and deep your inspiration has spread, even to this day. To Gary, also with whom I have run the Fast Track Mile, for inspiring me as I have watched you organize Run Through the Jungle, a benefit to support a large exotic cat sanctuary in rural Indiana. As important as running is, you have been a brother to me in things far beyond this earthly race. To Todd the golfer-turned-runner, for simply inviting me to run with you and reigniting a dear friendship. To Greg, for inspiring me with your dedication and commitment to the improvement of our home community and the running community there and beyond, but also for what you and your family have done in the creation of Cross Country Town USA. To bring the NCAA Division I Championships and other significant running events home to Indiana is a great accomplishment and a great thing for home. I can only say that I am both sorry and relieved I did not get to run directly against you in high school. I have a pretty good idea how it would have turned out. To Bill, my other faithful neighborhood running partner and close confidant; my “Brother across the road.” I can still see the five-foot-long black snake we both almost trampled because we were running without our glasses and thought it was a tree limb in the road. At the last moment we leapt over it – high. I am glad you recognized it first! Like Gary, our friendship goes far beyond just this. And to my son Jace, who ran the Fast Track Mile with me in 2012. No greater honor could I have to have you as my running partner. Read more about TOM, The Oberlin Mile here. Read more about The Mayor’s Cup Mile, now the Fast Track Mile here. Read more about Cross Country Town USA and the Lavern Gibson Championship Cross Country Course here. Read more and the Run Through the Jungle here.